I’ve written multiple times on the atrocity that is mountaintop removal. Here is my most recent article. Today there were massive protests and arrests at Marsh Fork Elementary in Sundial, West Virginia, where children there face the threat of air pollution and toxic contaminants from mountaintop removal operations. 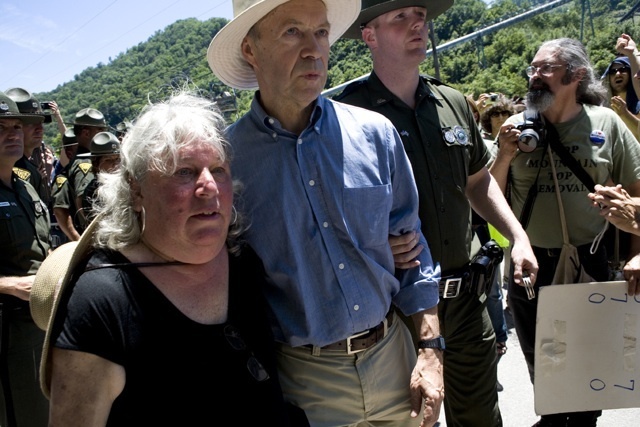 There were some notorious names in the crowd including top NASA climate scientist James Hansen, 94 year old former Congressman Ken Hechler, and actress Darryl Hannah. Jeff Biggers is an excellent writer in West Virginia in depicting the urgency and seriousness that surrounds the situation, and he covered the entire event in real time here. James Hansen explained his rationale for participating in the protest and in ending mountaintop removal with this letter to President Obama. Below is a video from today. I’ve noticed an shift of recent. Ordinarily whenever I see a report about climate scientists issuing reports detailing the implications of man-made global warming, and the need for policy action, this is as far as they go. Now, some climate scientists are taking it one step further, and actually becoming political advocates for the policies they bring up in their reports. This recent article gives a fascinating look into how some of our climate scientists are now becoming activists. NASA scientist James Hansen is one of them, and that’s no surprise to me, but the scope is greater than I thought. A few notable excerpts from this article are below. Now I am all for our scientists being as vocal as necessary on this issue. I think for far too long they haven’t done a good enough job of conveying their findings in their research to people. At the same time, climate scientists have been shouted down for decades by fossil fuel based corporations, a clueless media, and weak politicians. Good for them for finally raising their voice over the chatter. Now other people might take a different stance, which is that scientists should stick to publishing their research, and stay out of politics and activism. It could even be argued that by having one foot in each world: the scientific community and the political community, these scientists are making themselves less credible. I don’t agree with that, but I recognize it as a fair opinion(so long as it isn’t motivated by the fact that you think global warming is a hoax). My prediction from what I’ve seen in these articles, as well as the trends is that in the coming months and years, climate scientists will become increasingly more vocal in the political community, and add a new dynamic to the environmental movement. I think it will be for the better.